Specializing in small group tours to Scotland, Ireland, Wales and England featuring amazing castles, cozy pubs, unique tearooms, glorious gardens, spectacular scenery, sparkling lochs and picturesque villages. As promised today, castles seven through twelve. Remember, this is by no means a complete list of my favorite castles or neccesarily my top twelve. When we are conducting our tours, I like to include a really good mix of castles to give a full example of all the types of castles you will find in Scotland and this list reflects that. First on todays list is Elcho Castle just outside of Perth in central Scotland. There are several castles in the area that are very similar but this castle captivated me from the moment I walked in. The castle is not one of Scotland's most well known or visited castles and that may be part of the attraction. Elcho is a 16th century z-plan tower house that although in ruins is very well preserved and gives great insight into how its residents lived. It is fully open to the public and is a great castle to go exploring in. The castle has one of the largest and grandest staricases anywhere in Scotland and you can still see decorative plasterwork in many areas. Elcho is owned by Historic Scotland and open in the summer months. Second our our list today is Kilravock Castle just a short ways outside of Nairn in the north. This castle also operates as a bed and breakfast and I have had the pleasure of staying here a few times. Kilravock is the ancestral home of the Clan Rose and although the castle was built in 1460, six generations of the family lived on the grounds before that time. This is not a luxury hotel as many of them have turned into but an actual castle where you stay in the original rooms. You can even stay in the room at the top of the tower that dates back over 500 years ago! The room just below it is where Mary Queen of Scots stayed when she visited the castle and it has been preserved in that era. For a true castle experience, this is one of the best. Kilravock is open as a bed and breakfast and also for tours by appointment where you can hear tales of the past, see the room that Mary Queen of Scots slept in, view the bowl that was used by Bonnie Prince Charlie during his visit in 1746, inspect the dungeon and view historical artefacts from the battles of Culloden and Bannockburn. Our third castle listing is Thirlestane Castle in the Borders region of Scotland at Lauder. Thirlestane's history goes back to the 13th century but it was rebuilt as the Maitland family home in 1590. In 1670 the Duke of Lauderdale greatly enhanced it in the Scottish Baronial style. He introduced the two front towers and the grand staircase and oversaw the transformation of the interior, the most remarkable feature of which is the rich plasterwork of the State Rooms. in 1840 it was extended and refurbished with the addition of two new wings and now resembles a palace more than a castle and it is truly stunning. I love ceilings and the ceilings in the drawing room and dining room are breathtaking! You can also view the Duke's grand bedchamber and the room where Bonnie Prince Charlie stayed. The castle also offers self catering accommodation. The castle is privately owned and open May through September. Our fourth offering today is Braemar Castle in the Grampian Mountains at the start of Royal Deeside. Braemar is an early 17th century castle and is the ancestral home and seat of Clan Farquharson. The building is a five storey L-plan castle with a star-shaped curtain wall of six sharp-angled salients and three storey angle turrets. What it lacks in size it more than makes up for in charm and style. The castle was gifted to the community of Braemar by the Farquharsons and reopended in 2009 following a short restoration. There is now 12 fully furnished rooms on show filled with personal memorabilia of the family spanning over 250 years of the Farquharson family The Hanoverian troops garrisoned here after the Battle of Culloden ensured their place in history by graffiti-ing the wood panelling. The castle in open to the public. Our fifth castle is Duart Castle on the Isle of Mull and home to Clan Maclean. This castle is well know as the film location for Sean Connery's Entrapment. While taking the ferry from Oban to Mull the castle sitting on its crag is visible long before the fery docks. For me, the biggest delight of the castle is that on almost any day, you can see Lord Lachlan walking the grounds, greeting people to the castle or playing with his grandchildren. Although the seat of the Clan Maclean for over 400 years, it is also very much a family home. In 1350 Lachlan Lubanach, the 5th Chief, married Mary Macdonald, the daughter of the Lord of the Isles and she was given Duart as her dowry. After extensive restoration the castle is open to the public. Visitors may walk through the dungeons and state rooms at their leisure, ending on the top of the keep where it is easy to appreciate the strategic site of the castle. 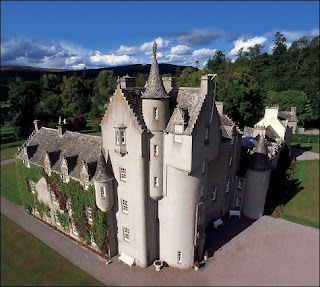 Our final castle is Ballindalloch Castle in the heart of the Speyside region of Scotland. Ballindalloch is one of the most beautiful and renowned castles in Scotland and know as the Pearl of the North. Ballindalloch is one of the few privately owned castles to have been lived in continuously by its original family, the Macpherson-Grants who have resided here since 1546. The Castle is very much a lived-in family home and is filled with family memorabilia, as well as a fine collection of 17th century Spanish paintings collected by Sir John Macpherson-Grant in the mid 19th century. From the moment you walk in the door you feel as if you could move right in. The Castle was originally built in the traditional Z plan, but has been much altered and enlarged over the centuries. Ballindalloch Castle exemplifies the transition from the fortified tower house necessary in 16th century Scotland to the elegant and comfortable country house so beloved of the Victorians in the Highlands. Ballindalloch is privately owned and open to the public.